This post appeared first on Reach Financial Independence. How do you save more? There doesn't seem to be enough money to save anything by the end of the month, does it? Saving money is not easy when you have never done it. But if you manage to form the habit, it will become second nature. Here are a few tips I use. For a week, write down everything you spend. Tedious, I know. But for every expense, ask yourself: Did I really need to spend that money? How could I avoid that expense? Did it bring me value? If it doesn't, stop. If it does, let's move on. I used to spend a lot on nights out, until we decided with my friends to gather at someone's place. Half the cost, same fun. It doesn't have to be drastic, or affect your lifestyle. Challenge the spending and find alternative ways to get the same value for less. One such challenge could be getting rid of one bad spending habit, such as eating lunch out every day. Try bringing lunch to work once a week. Then make it twice a week. Put the savings into a jar or a savings account. Throw all your spare change into a jar at the end of the day, and deposit the savings into your bank account at the end of the month. By making it fun, you will make it easier. You won't go from zero savings to $1,000 a month the first month. Try saving $5 or $10. Then try saving $5 more the next week. Before you know it, the slow increment led you to saving $50 a month. Which is better than nothing. Keep going until you feel the pinch. 4. Have a savings goal Why do you want to have savings for? Is it for a holiday, for a new car, for a deposit on your house? By having a goal, you will be able to ponder whether it is worth to spend $100 going out tonight, or have one day of fun on your next holiday. 5. Round it up When you spend $54.11 at a restaurant, round it up and save the $0.89. Some apps will do it for you and reroute the excess to savings automatically. Small amounts add up. 6. Get rid of the waste Do you often throw food? Have magazines piling up unread? Clothes you just wore once? All this is money you spent on things you don't need. Get rid of the ones you can (and make money in the process! ), and stop buying anything you don't use. Buy half the food you use to, and go through your freezer and cupboards for the rest of the week. Send the difference to savings. 7. Prioritize Pretend there is only money for one thing. Would you rather have HBO or go out once a month? Only keep the one you prefer. 8. Get a cashback card Or a loyalty membership to your favorite supermarket. Put the savings into... savings. 9. Get a discount On everything you buy. Try to get it for less. Look for online coupon codes, cheaper stores, ways to get it for free on Freecycle. 10. Cut down meat And other expensive items in your groceries, such as cheese or nuts. You can make a ton of delicious vegetarian dishes, or recipes with just a little meat as a way to add flavor. 11. Make your own coffee Coffee on the go is expensive! Buy a nice thermos for your car, flavorful beans and you're all set for a $0.10 cup. 12. DIY Be it painting the living room, fixing a leak, moving house, try to do things yourself instead of hiring out. There are plenty of online tutorials to help you out. 13. Master your FOMO It is OK to say no to peer pressure. Find cheap and free activities to do with your friends instead of the expensive one they suggest. 14. Get a roommate An easy way to save $500+ on rent, if you don't mind having less privacy. Again, remember why you are doing it and it will be much easier. 15. Carpool or cycle to work Socialize or get free exercise on your way to work, cutting on your commuting expenses. 16. Reconsider your car (or second car) Do you really need a car or two? How often do you use it? How much does it cost in maintenance, fuel, insurance, parking... is it cheaper than using Uber or renting one when you need? 17. Keep track of your progress It is easy to get frustrated when saving money. By keeping track of your progress, you will remain motivated. 18. Repair broken things Try to DIY or have things repaired for a fraction of the price of replacing them. 19. Look for free entertainment Your nearby college, the adult learning center, your church.. may have free or cheap activities for you to enjoy. 20. Bring your water bottle Bring water everywhere you go and avoid buying bottles that are not only expensive but also bad for the environment. 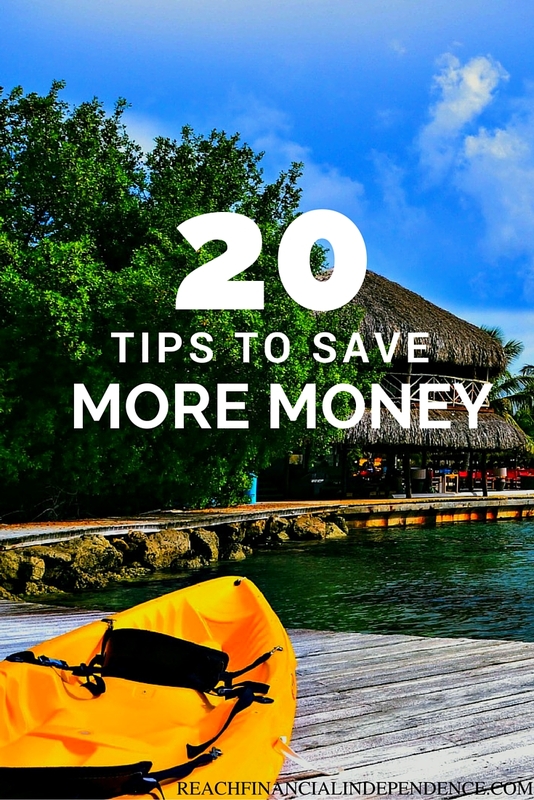 Saving money is a slow process, but it doesn't have to be painful. 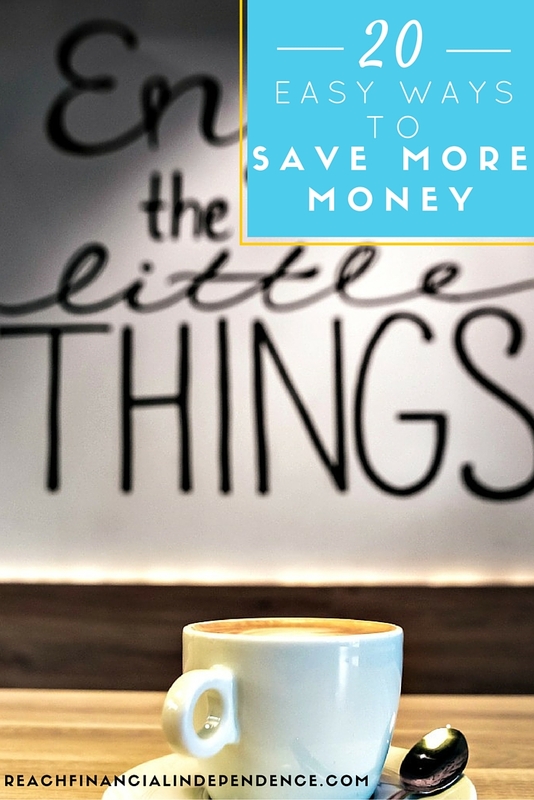 With these little tips, you can easily get started and gain momentum to save more and more!